Chip Hallock, President and CEO of the Newark Regional Business Partnership to host REAP NJ Spring Event on Tuesday May 15, 2018. Chip Hallock is president and CEO of the Newark Regional Business Partnership (NRBP), the pre-eminent membership-based organization connecting businesses in the Greater Newark region. By connecting, informing and advocating on behalf of its members, NRBP strengthens the region’s infrastructure and revitalizes New Jersey’s largest City. Hallock was hired as NRBP’s CEO in January 2000 after thirteen years at the Paramus-based Commerce and Industry Association of New Jersey including seven years as its president. Prior to CIANJ, he served as executive director of the Foundation for Free Enterprise, a free market educational organization where he built upon his previous experience as a high school educator. Hallock graduated from Moravian College with a BA in Social Sciences and is a graduate of the U.S. Chamber of Commerce Institute for Organization Management at University of Delaware. 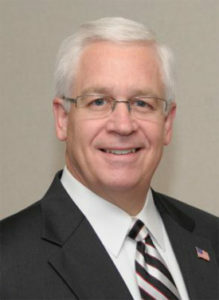 Hallock recently concluded two terms as a member of the Board of Directors and Finance Committee for the Association of Chamber of Commerce Executives (ACCE), the national organization for chamber of commerce professionals, and is a past president of the New Jersey Association of Chamber of Commerce Executives. He serves on the governing boards of Greater Newark Convention and Visitors Bureau, Greater Newark Enterprises Corporation, Newark Police Foundation, Newark Symphony Hall, Newark Workforce Development Board, University Heights Science and Technology Park, EZ Ride/Meadowlink Commuter Services and the advisory boards of Newark College Institute and New Jersey Small Business Development Centers.